We've included listings for companies such as Dacor and Empire West Inc. inside our Metal Tiles guide. Offering hand-crafted pressed tin wall hangings and replicas of antique ceiling tiles. Large volume maker and direct seller of largest tin ceiling panels, with 24 patterns available in 45 powdercoated colors. Company uses three 200 ton presses and its own powdercoating plant. Bear Creek Bronze manufactures unusual decorative metal tiles, cabinet hardware, switch andoutlet covers, address plaques and house numbers, and custom embellishments in bronze, copper, white bronze, yellow brass, or aluminum. Starting with a revolutionary indoor barbecue system in 1931, this California company sells a wide range of innovative home appliances. 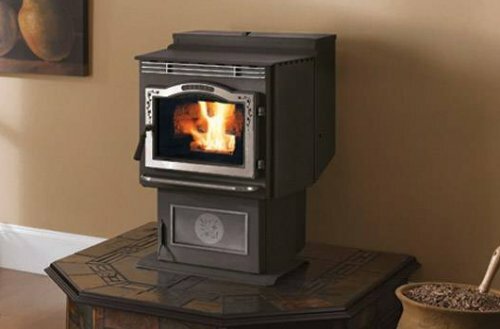 Infrared gas broilers and convection ovens, stainless steel outdoor cooking centers and warming drawers are among the appliances sold through company-owned showrooms. Leading maker and seller of Victorian-style tin ceiling panels, with over 100 patterns in 11 designer finishes. Patterns also can replicated/customized to your specifications, and the company offers a line of 2 x 2 panels that can be nailed-up or laid into new or existing suspension ceilings. Company installs and restores slate, clay tile and metal roofs, as well as copper and integral gutter systems. Also supplies new tiles. Artisan designs original copper items from range hoods to sinks, countertops and mailboxes in Craftsman and mid-20th century motifs. Maker of Ceilume smart ceiling tiles designed to fit into suspended T-Bar ceilings while providing the look of a classic tin ceiling, but at a lower cost. Founded by master artisans in metalwork and glazing, Carina Works specializes in unique aluminum cabinet hardware, and metal tiles for walls and floors. 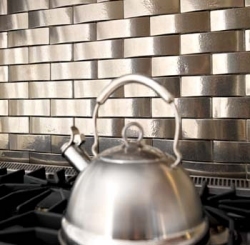 Bronze tiles make a distinctive backsplash.